People love video. Humans are visual creatures and video gives us a special connection to what and who we are watching. It’s engaging and exciting. Video makes everything seem more real and alive. Nowhere is this more apparent than travel. People love to see and experience places, know what they look like, hear the sounds, and watch people interact. It allows us to go “wow” and imagine ourselves there a lot easier. 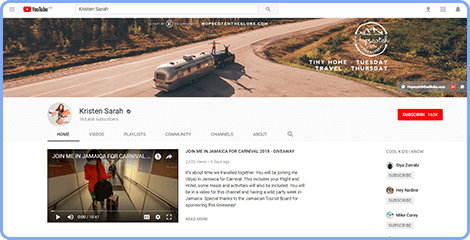 It’s why the Travel Channel is so successful – and it is why online travel videos so some of the most popular on YouTube. 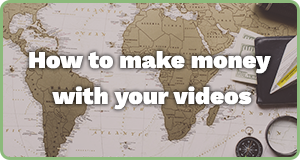 If you’ve been thinking about getting into the travel video world, NOW is the time to kickstart your career making travel videos. Video is the wave of the future in the travel industry. 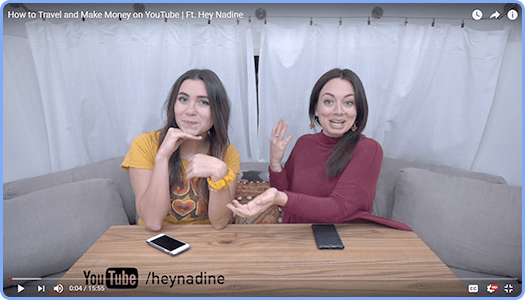 Now, two of the biggest travel YouTubers in the world, Nadine Sykora (from Hey Nadine) and Kristen Sarah (from Hopscotch the Globe), to create an in-depth course on how to make videos and succeed at YouTube. Nadine and Kristen have both been making video for over 10 years and have a combined 400,000 subscribers and 53,000,000 views (and growing). They have worked with some of the biggest brands, tourism boards, and production companies. They are two of the most successful pure travel “vloggers” on YouTube and regularly speak at industry events on the subject. 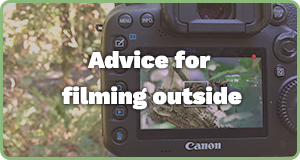 There’s no one better suited to help you make video! Nadine and Kristen are experts at video — but they didn’t start out that way. They were just like you: with a desire for travel, a passion for video, and a dream. Like you, they didn’t know where to start, were a bit unsure of their skills, nervous about being on camera, and made mistakes in the beginning. 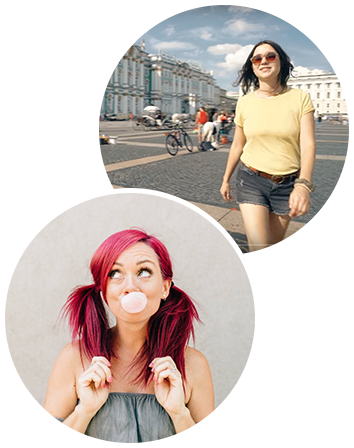 This amazing online travel video course to give you the information Nadine and Kristen have learned through trial and error so that you don’t make the rookie mistakes most other vloggers make. We created this course so you don’t follow fads, wonder if you’re doing the right thing, or burn bridges by networking the wrong way. Go behind the scenes at how they make, edit, and monetize their channel. Follow them as we film them filming a video together, watch them edit videos as they dissect why they included certain footage (and why some ended up on the cutting room floor), and learn how they have masterfully connected with bigger stars, brands, and their readers as they get paid to travel the world. Today, platforms such as YouTube have allowed creatives to thrive and make a living from their art. 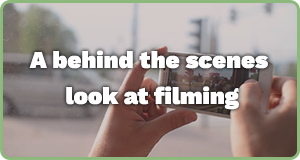 In fact, there are online video creators making millions and replacing the faces of television and film in some of the largest brand campaigns. 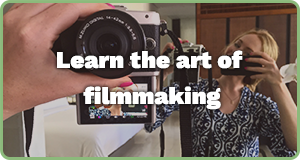 In this self-paced course, Kristin and Nadine pull back the curtain and through video instruction, step-by-step guides, photo and video examples, and at-home exercises, this course gives you a complete understanding of how to succeed with video online. 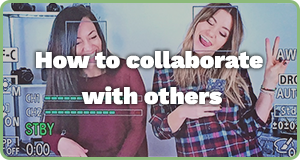 They will make sure you know what works, help you limit your mistakes, and provide guidance so you can get a leg up on the seemingly endless supply of new vloggers. 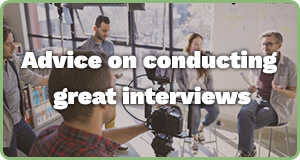 Get Over 4 Hours of Expert Interviews! 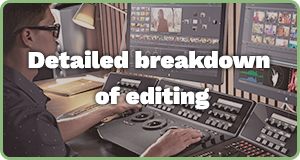 Learn how to edit, market, and create videos people want to watch from five other major YouTubers and video producers! Abby has won awards for her documentary shorts and films. Previously a producer of shows on MTV, she is now a director on Netflix’s Chef’s Table. 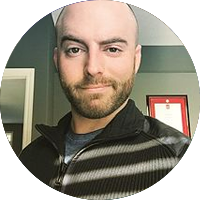 Matthew is a Canadian YouTube personality. He focuses his video on comedy. He also frequently keynotes at major video conferences around the world. 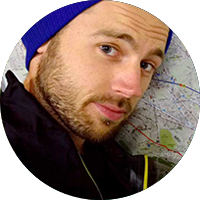 Mark runs the blog and YouTube channel Migrationology. Tasting food from around the world is his passion. He and his wife shoot videos about Asian food, culture, and activities. 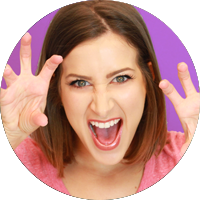 Alli is popular vlogger who focuses on travel, comedy, and daily life. 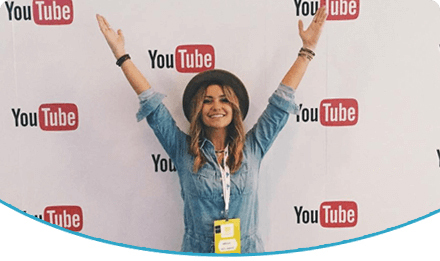 She’s widely considered one of the most successful general vloggers on the web. Mike is a breakdancing marine biologist turned travel videographer. 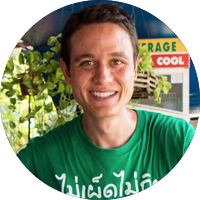 He is the founder of Kick the Grind and one of the biggest up-and-coming travel vloggers on the web. 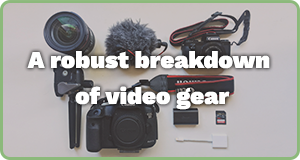 If you are looking to get started with video but aren’t sure where to start and want some direction, this course is for you. 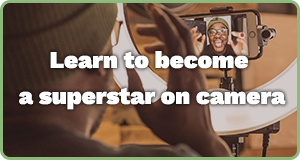 With this course, you’ll be able to avoid the mistakes newbies make, find out what works, and start growing your video empire right away — instead of just fumbling around in the dark! You get lifetime access to all the materials as well as any future updates. 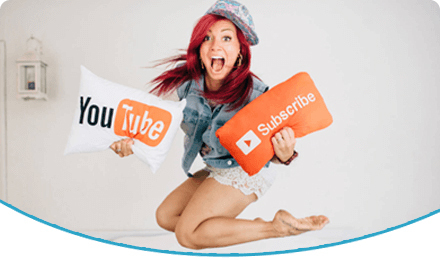 We’re fully committed to helping you improve your vlog and become a success. You can test-drive the course for 30 days, read the material, and listen to the webinars and interviews. If you complete the assignments and do the work but still don’t feel the course is right for you or will improve your vlogging, we’ll happily refund 100% of your money. 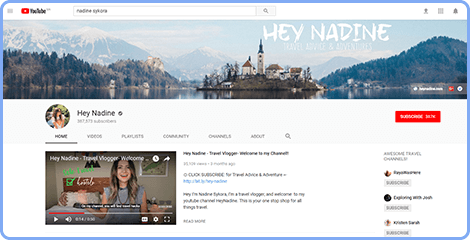 Nadine (Hey Nadine) is one of the top travel videographers and travel video content creators on YouTube. Since 2008 she has made over 900 videos, gaining over 37 million views and over 300,000 subscribers to her YouTube channel. She has been named one of USA Today’s top travel experts and one of the most influential digital media outlets by the White House. 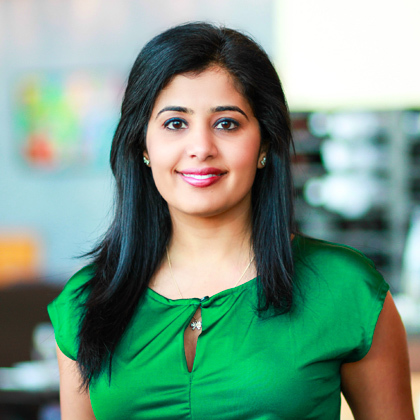 She’s also been on expert business panels and has given keynotes at numerous video and travel conferences. Over the years, she has written, produced, and created dozens of video campaigns for some of the biggest international brands, companies, and tourism boards. Kristen is one of the top travel videographers and travel video creators on YouTube. 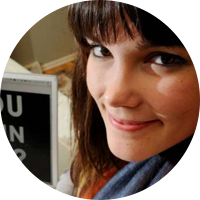 Her channel, Hopscotch the Globe, has over 16 million views and over 100,000 subscribers. She’s been creating professional video content for the past ten. She’s worked both behind and in front of the camera for major Canadian and US television productions such as MTV, YTV, and Much Music. Kristen has been named one of USA Today’s top travel videographers, one of Matador’s top travel YouTube creators, and one of the most influential women in travel by Flight Centre; she also creates regular video content for Lonely Planet and Mode.com. This course is unit based, with individual lessons in each unit. Every unit is broken into thematic parts and, while the course is given out all at once, we highly suggest you start at the beginning. What if I get really confused or stuck? Can I get feedback? Yes! We’re here to be your mentors. We have a lively community group where we answer questions and you can always email us if you need! We get back as soon as we can – and we always get back! You don’t need to travel all the time. If you aren’t exploring the world, explore your backyard. You can vlog about the local area. As long as you have some travel experience, a passion, and take at least one trip a year, we can show you how to make it work. We’re fully committed to helping you improve your vlog and become a success. You can test-drive the course for 30 days, read the material, and listen to the webinars and interviews. If you still don’t feel the course is right for you or will improve your vlog, we’ll happily refund 100% of your money.